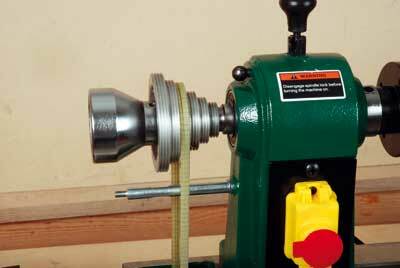 I am a fan of mini-lathes and there are a few on the market that deserve serious consideration when thinking of a purchase. Coming in near the top of the usual price range is the new Record DML 305. To my mind, it is in league of its own when it comes to ease of use and the quality of the castings, finish and fittings. 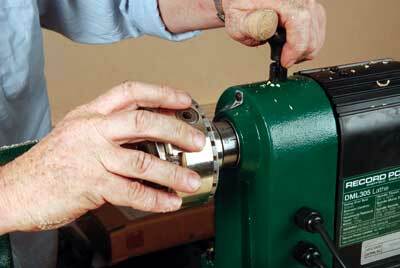 I like quality tools and I liked this little lathe. Setting up the lathe straight out of the box took about half an hour. There were no tense moments or bad language needed because all the bits fitted well and worked smoothly from the off. The instruction book is something of an example to others, being clearly written and well illustrated with close-up photographs of various things where necessary. A foldable steel handle at the headstock end helps the hefting of it a great deal, and despite being over 25kgs in weight, it is just about possible for one person to lift it into a car boot, which is useful for shows or demonstrations. The cast iron bed was particularly impressive, being accurately ground and smoothly finished. I screwed the lathe to the bench for test purposes and was very quickly able to mount a piece of softwood between the two good-quality centres supplied. The powerful motor runs smoothly and silently, and the weight of cast iron relative to its size meant that very little vibration was passed to the user. The range of speeds is very good and easy to change because the plastic belt cover needs only a small bolt to be loosened to gain full access. The Poly-V belt drive is smooth and positive. 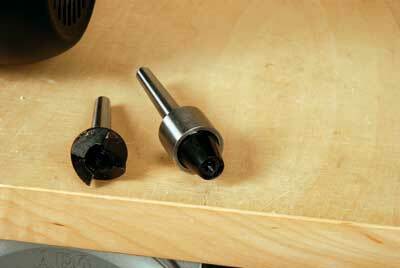 I had to be impressed with the quality of the cam locks and Bristol levers. 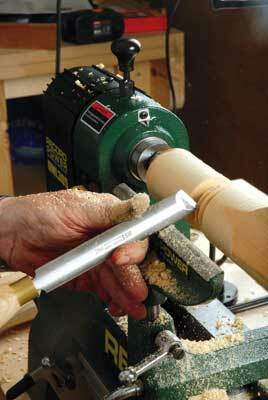 All are hard-chromed, shiny and really easy to adjust. It is also great to see a play-free spindle lock and 12-position indexing on the headstock spindle as well as graduated markings on the tailstock barrel. The overall standard of finish is as good as that on my Sheffield-made CL4 machine and there are no casting nibs or sharp bits to catch an unwary hand. I did fit my chuck to the headstock and try out a few moves but I was unable to complete a bowl in the time I had available. 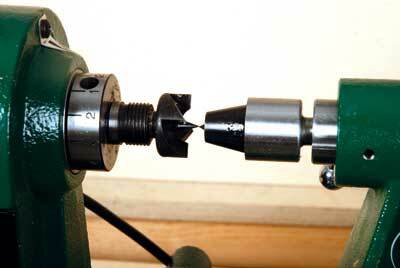 Access to the inside of the bowl turning was good when the tailstock was moved out of the way. I could see how easily I could use this lathe to make a range of bowls of an easily usable size without having the bulk of a much larger machine. Although I didn't get the chance to test it, I had a very close examination of the DML 305 with its bolt-on bed extension and steel leg set. I expected at least a tiny gap between the bed and its extension, but the sample I saw allowed free tailstock and tool rest movement and accurate alignment. These make the lathe quite "future proof" for potential purchasers who would like to try turning and may like to expand it at a later date. 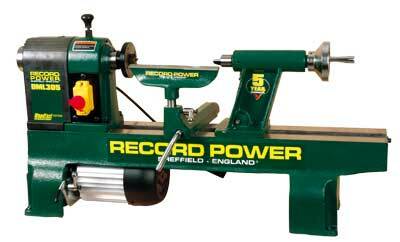 Extra tool rests, longer banjos etc., are all readily available from Record Power. Having bought a different but decent mini-lathe recently, I would have preferred to have known about the imminent arrival of the Record Power DML305 sooner. Although more expensive than many others, it offers value, quality and perchance the opportunity to expand into a bigger lathe. There seems to be little to criticise on the DML 305. 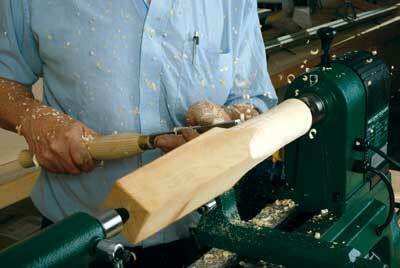 "It is in a league of its own when it comes to ease of use and the quality of the castings, finish and fittings"